Each spring, chocoholics around the world go crazy for Cadbury. The British confectionery company produces more than 500 million creme eggs per year—and the fondant-filled treats are no longer just for Easter baskets. Creative chefs deep-fry Creme eggs, sandwich them between brioche buns to make Cadbury “hamburgers,” and even mix them into cocktails. 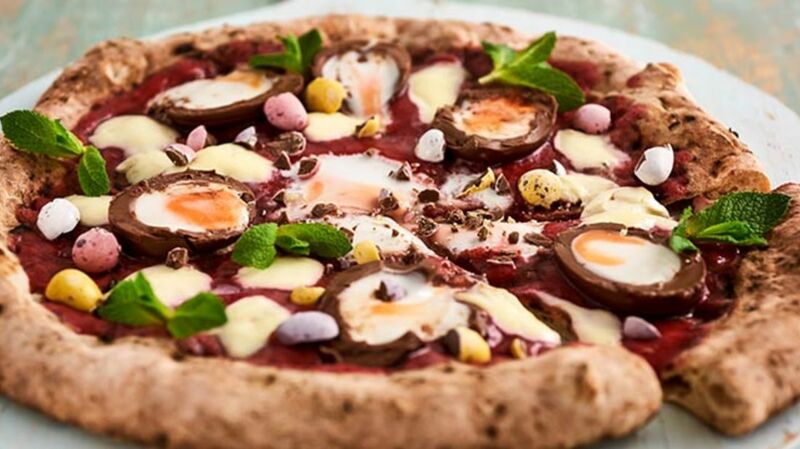 Now, Mashable reports that Deliveroo, an online food delivery company in the UK, has introduced a limited-edition Creme Egg pizza. The pizza is called the Fior-egg-tina, and it’s available to order from Crust Bros., a pizza restaurant in London. As the name suggests, it’s intended to be a sweet twist on the classic Fiorentina pizza, which is traditionally topped with a combination of tomato, mozzarella, spinach, and egg. Instead of tomato sauce, the Fior-egg-tina is smothered in macerated strawberries, mascarpone, mint, and, of course, Creme Eggs. Customers can even sprinkle crunchy Mini Eggs onto the pizza instead of parmesan. The Fior-egg-tina will soon be available to order from Crust Bros. via the Deliveroo website or app. It’s only available in London, from April 7 to 14, but at-home chefs can probably adopt the idea and use excess Easter basket bounty to make their own versions. Check out some pictures of the sweet pizza below. All images courtesy of Deliveroo.